Jesus begins the Sermon on the Mount with what we call the beatitudes. A beatitude is a condition of supreme well-being, joy, happiness, and cheer. 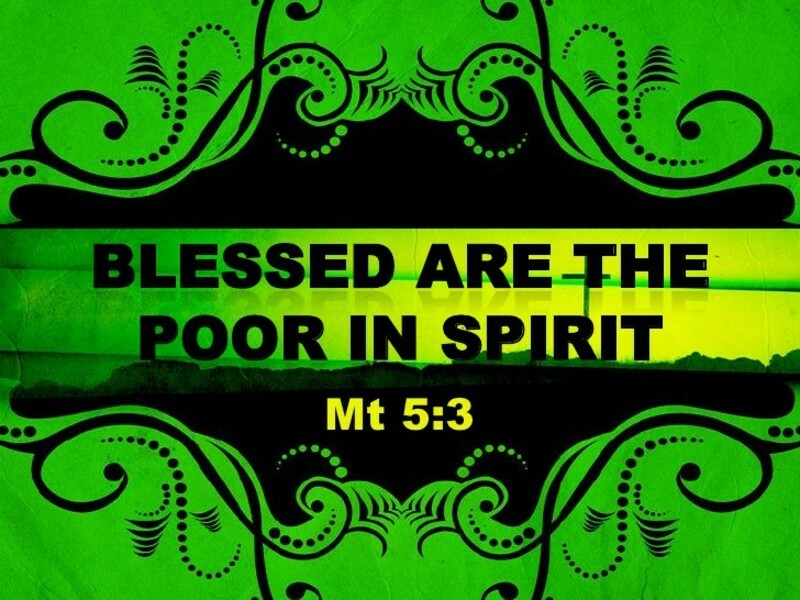 Jesus begins each of the beatitudes saying, “Blessed.” Blessed means fortunate, well off, or happy. However, Jesus is not talking about a superficial blessing; the beatitudes are not a promise of laughter, pleasure, or earthy prosperity. Jesus does not bless what we might expect. “Blessed are the poor in spirit; blessed are those who mourn; blessed are the meek and gentle; blessed are those who are persecuted.” These are definitely not most people’s idea of who is blessed, but these are the people God approves and blesses. And there can be no higher “blessing” than to have God’s approval. God’s blessings are eternal, things money cannot buy. We will look at all of these beatitudes over the next several weeks. 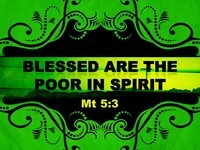 Matthew 5:33 Blessed are the poor in spirit, for theirs is the kingdom of heaven. This is the first beatitude. To understand what Jesus is saying in this beatitude, the first step is to know what He is not saying. “Poor in spirit” does not mean financial poverty. In fact “poor in spirit” has nothing to do with money. Our personal wealth or lack of wealth is not what Jesus is referring to. Yet some teach that to be truly blessed by God we must poor. Others teach that wealth is a sign of God’s blessing. However, money is not the issue in this beatitude; the real issue is the condition of our heart. Our heart is what God judges. You see, we could be financially poor, having nothing, and still not be “poor in spirit”, because we are focused on ourselves and our condition. On the other hand, we could be rich and optimistic about life, but still lack the blessing of being “poor in spirit” because we are self-confident. Notice the “s” in spirit is a small “s”, referring to man’s spirit—not the Holy Spirit. Therefore, “poor in spirit” does not refer to one lacking the Holy Spirit. We are commanded to be filled with the Holy Spirit. Those who are controlled by their own spirit are not “poor in spirit”. They are willful, rebellious, stubborn, selfish, ambitious, unteachable, self-centered, contentious, divisive, demanding, discontented, unfaithful, ungodly, and unable to receive the Kingdom of Heaven. Whereas, those filled with the Holy Spirit, possess the character of the Spirit and the Kingdom of Heaven. Gal 5:19-23 The acts of the sinful nature are obvious: sexual immorality, impurity and debauchery; idolatry and witchcraft; hatred, discord, jealousy, fits of rage, selfish ambition, dissensions, factions and envy; drunkenness, orgies, and the like. I warn you, as I did before, that those who live like this will not inherit the kingdom of God. But the fruit of the Spirit is love, joy, peace, patience, kindness, goodness, faithfulness, gentleness and self-control. Against such things there is no law. Those who belong to Christ Jesus have crucified the sinful nature with its passions and desires. “Poor in spirit” also does not mean being spiritually immature. Maturity is not dependent upon our Biblical knowledge, but upon our obedience to the Word of God. Genuine maturity is proved by our love for God and for one another, and not by how much of the Bible we can quote. Again, “poor in spirit” is a matter of our heart. Is 66:2 Has not my hand made all these things, and so they came into being?" declares the LORD. "This is the one I esteem: he who is humble and contrite in spirit, and trembles at my word. So, what does it mean to be “poor in spirit”? Putting it simply, THE “POOR IN SPIRIT” DIE TO SELF DAILY. The “poor in spirit” surrender complete control to God and are blessed because they experience the Kingdom of Heaven each and every moment of the day. Proverbs 16:19 Better to be lowly in spirit and among the oppressed than to share plunder with the proud. Pride is the opposite of “poor in spirit” and says, “I don’t need God.” Pride was the essence of man’s fall in the Garden of Eden, which was the Kingdom of Heaven on earth. The temptation in Gen. 3:5 was “…you will be like God, knowing good and evil.” There was something appealing about that temptation—it was that mankind would no longer be dependent upon God. Every day up to that point, Adam and Eve were totally dependent upon God and enjoying the Kingdom of Heaven on earth. The reason for the fall is that they no longer wanted to be dependent upon anyone but themselves. They wanted to be their own god. And we’ve been living that way ever since. As a result, instead of enjoying the Kingdom of Heaven, we suffer from Hell on earth. “Poor in spirit” means being totally dependent upon God. It is part of loving Him intimately with all our heart, soul, mind, and strength. Psalm 51:16-17 You do not delight in sacrifice, or I would bring it; you do not take pleasure in burnt offerings. The sacrifices of God are a broken spirit; a broken and contrite heart, O God, you will not despise. “Poor in spirit” is also a broken spirit; a broken and contrite heart. As such, it is the deepest form of repentance. It is not a confession that we are insignificant, or personally without value, because that would simply not be true. Rather, it is a confession that we are by nature sinful, rebellious, and in need of God’s mercy and forgiveness. It is admitting that we are nothing without Him. It is not a one-time act, but an everyday lifestyle. Consequently, “poor in Spirit” is not thinking poorly of ourselves, it is thinking properly of ourselves. False humility is as bad as the pride that breeds it. “Poor in spirit” is acknowledging we are a sinner, incapable of doing anything with the right motive, without the presence of God in our life. In other words, there is no good thing in our spirit except Jesus Christ, our Lord. “Poor in spirit” also means thinking properly about others. If we are “poor in spirit”, we realize that everyone else has the same need for God’s grace and mercy that we have—that we are no better than anyone else in God’s eyes. If we are “poor in spirit”, we are happy when others succeed. When they fail, we show them the same grace and mercy God has given us. “Poor in spirit” does not look for the “big opportunities” to serve God. “Poor in spirit” looks for whatever opportunity God places before us and accepts it. God’s greatest desire for us is to be like Jesus and to experience His Kingdom of Heaven—a Kingdom of love, peace, and joy in everything we do for Him. If we are living our lives like Jesus, then we will be His hands, His feet, and His voice; we will walk where Jesus walks, do what Jesus does, and say what Jesus says. We will be in constant fellowship with our Father in Heaven. Furthermore, if we, as a church, live like Jesus, then we will be a joyful and loving church, which other people will want to be a part of. We will be a little bit of “heaven” on earth. As Christians, we live in the world, but we are not to be of the world. Our minds should not be squeezed into the mold of the world, but be transformed and renewed to think like Jesus, the King of the Kingdom of Heaven. Walking after the Spirit means we think and act like Jesus! Rom 12:1-2 Therefore, I urge you, brothers and sisters, in view of God’s mercy, to offer your bodies as a living sacrifice, holy and pleasing to God—this is your spiritual act of worship. Do not conform any longer to the pattern of this world, but be transformed by the renewing of your mind. Then you will be able to test and approve what God’s will is—his good, pleasing and perfect will. Like Jesus, our lives are to be a living sacrifice to God. To become a “living sacrifice,” we must consider ourselves dead, and surrender control of our lives to God. We must be “poor in spirit”. 2Cor 5:15 And he died for all, that those who live should no longer live for themselves but for him who died for them and was raised again. When God is in control, Jesus says we’re blessed and ours is the Kingdom of Heaven, now—even on earth! When God is in control, we live in His Kingdom—a place of peace, joy, love, and security in the presence of God. That sounds wonderful! So why don’t we give God control and receive His blessing? For one thing, we are sinful and that makes surrender a constant struggle. Furthermore, there is little encouragement or example of surrender. People all around us are living for themselves. Most people would agree: what is really important is to look out for yourself! However, God won’t accept our excuses. If we are going to receive the Kingdom of Heaven, then we must be “poor in spirit.” God’s blessing will only be given to those who die to self and live for Christ. So what does it look like when we are “poor in spirit” and willing to die to self? Again, the “poor in spirit” are broken, contrite, and submitted to Jesus. Speaking to the Pharisees, Jesus shows the contrast between those who accept or reject Him as the cornerstone of life. All, who are unwilling to accept Christ as their Lord and Master, will be crushed and completely destroyed. The Pharisees understood Jesus meant they would be among those crushed. They were extremely religious and moral, and therefore, insulted by Jesus’ remark. They wanted to have Him arrested on the spot, but they were afraid of the people. The Pharisees were like many religious people today. They do not understand their need to fall upon Jesus and be broken. Jesus uses this figurative image of falling upon the cornerstone to illustrate how our pride and self-dependence must be broken! God knows if we are never willingly broken, then we will be crushed and utterly destroyed on the Day of Judgment. Our pride also keeps us from seeing Jesus for who He is. Until we are broken, we see God in our image with the same limitations we have. But once broken, we can see God’s omnipotent power, His omniscient knowledge, and His abundant grace poured into our lives because of what Jesus did on the Cross. Ps 34:18 The LORD is close to the brokenhearted and saves those who are crushed in spirit. When we realize our need for salvation, we fall broken upon the Lord, and Jesus saves the brokenhearted. Until we are broken, we cannot see ourselves as we really are. We think we are moral, but after we are broken, we see how utterly sinful we are. We believe we are strong, but suddenly we understand how weak we really are. After we are broken, God saves us, repairs our lives, and reshapes us into the image of His Son. Therefore, brokenness and contrition are needed in our lives to be “poor in spirit” and to receive the Kingdom of Heaven, where Christ abides. When we come to God in brokenness and contrition, confessing Jesus as the Christ and our Savior, God loves us and accepts us, but He loves us too much to leave us that way. Is 57:15 For this is what the high and lofty One says—he who lives forever, whose name is holy: "I live in a high and holy place, but also with him who is contrite and lowly in spirit, to revive the spirit of the lowly and to revive the heart of the contrite. The beatitudes tell us whom God blesses. The first is “the poor in spirit”, which describes those who die to self, are broken, contrite, humble, and dependent upon God. Unless we are “poor in spirit”, we cannot be like Jesus; therefore, we cannot be Christian—that is—Christ-like. Neither can we experience the Kingdom of Heaven. As Jesus begins to teach, immediately, the first beatitude shows us that we do not have the spiritual resources to put any of the Sermon’s precepts into practice. We cannot humanly follow these standards. We need the Holy Spirit. We have to realize we have nothing to offer, nothing to plead, and nothing with which to purchase the favor and forgiveness of God. We need a Savior! If we are to find the Kingdom of Heaven, we must admit to God we are hopeless, helpless, and in need of salvation. We must come to the point in our lives when we realize that nothing in this world can fill our spiritual need except Jesus. Therefore, we must come to Jesus and acknowledge our spiritual bankruptcy, emptying ourselves of our self-righteousness. That is what it means to be “poor in spirit”, and that is the spirit that is necessary to accept Jesus as Lord and Savior and to live in the Kingdom of Heaven with the righteousness of God, not our own. If you have never given your life to Jesus Christ, you have no chance at the Kingdom of Heaven. If you believe Jesus is the Christ, the Son of the Living God, then He deserves the right to control your life because He purchased it with His own Blood on the cross. Give it to Him by confessing your faith with your mouth, repent of your sin and independence, and die to yourself in water baptism so that the Holy Spirit can abide in you and give you a new life in the Kingdom of Heaven.